Over the past year, there have been some pretty big improvements to Puppet. I am still running PE 2016.4.2 and the current version is 2017.3.2, so there’s lot of changes in there. Most of the changes are backwards-compatible, so an upgrade from last November’s version is not quite as bad as it sounds, and I definitely want to start using the new features and improvements. The big one for me is Hiera version 5 (new in Puppet 4.9 / PE 2016.4.5). It is backwards compatible, so you can start using it right now, but it does require some changes to take advantage of the new features. I have to upgrade the server, upgrade the agents, and then start implementing the new features! Why do I care about Hiera 5 in particular? Hiera 3 was great, but you could only use one hiera setup on a server, regardless of how many environments were deployed on that server. This could cause problems when you wanted to change the hiera config and test it. You could not test it in a feature branch, it HAD to be promoted to affect the entire server. If you had multiple masters, you could change the config on just one, but that was about as flexible as hiera 3 would let you be. If it worked, awesome. If it broke, you could break a whole lot that needed undone before you could try again. Hiera 5 introduces independent hierarchy configurations per environment and even per module! If you want to try out a new backend like hiera-eyaml, you can now create a new feature branch eyaml-test, update the configuration in that branch, push it, and ONLY nodes that use that environment will receive the new configuration. This is a huge help in testing changes to hiera without blowing up all your nodes. The per module hierarchy also means that module authors can include defaults that use hiera, rather than the params.pp pattern. This makes it easier for module users to override settings. 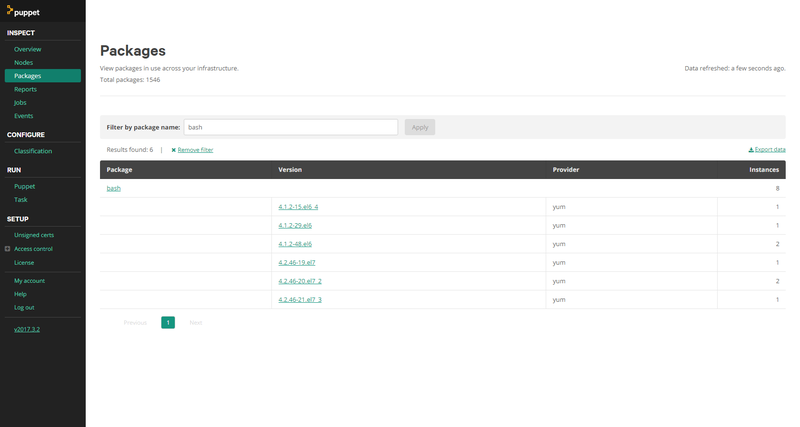 There are also improvements in the interface for those who want to create their own backends. And, best of all, hiera 5 means the name hiera is here to stay – no more confusion between “legacy” hiera and modern lookup, it’s all called hiera 5 now. It does mean there are some deprecations to keep in mind, but they won’t actually go away until at least Puppet 6. You can use hiera 5 now and take some time to replace the deprecated bits. This does mean we can use our existing hiera 3 setup and worry about migrating it to hiera 5 later, too, which we will take advantage of. I always prefer to upgrade to the latest version. If for some reason you’re upgrading to Puppet 4.9, be aware that Puppet 4.10 fixed PUP-7554, which caused failures when a hiera 3 format hiera.yaml was found at the base of a controlrepo or module. I kept a hiera.yaml in the root of my controlrepo for bootstrapping purposes for a long while, and if you do, you could hit that bug. Best to just move to the latest if you can. I think most people will like Hiera 5, but there are a ton of other features (listed at the end) and even if nothing appeals specifically, it is good to stay up to date so you don’t get stuck with a really nasty upgrade process when you find a feature you really need. Please, don’t let yourself get a full year behind on updates like I did. Sometimes it’s really difficult to get out of that situation! I use Puppet Enterprise at both work and home these days, so I will go through the PE upgrade experience. The Puppet OpenSource install and upgrade instructions are on the same page of the documentation, so it seems pretty easy but your mileage may vary, of course. First, take a look at your installation and make sure it’s in a known state – preferably a known good state all the way around, but at least a known one. If you have outstanding issues on the master, you need to resolve them. If some agents are failing to check in, you may want to take the time to fix them, or you could just keep track of the failures. After the upgrade, you don’t want to see an increase in failures. Once everything looks good, take a snapshot of your master(s) and a full application/OS backup if possible. If you have a distributed setup, perform this on all nodes as close to the same time as possible. ## We've detected an existing Puppet Enterprise 2016.5.2 install. ## We've found a pe.conf file at /etc/puppetlabs/enterprise/conf.d/pe.conf. The install takes a bit of time (30 minutes on my lab install). Once the upgrade is done, you’ll be directed to run puppet agent -t (with sudo of course). If you have additional compile masters or ActiveMQ hubs and spokes, also run the commands in steps 4 and 5 as well. 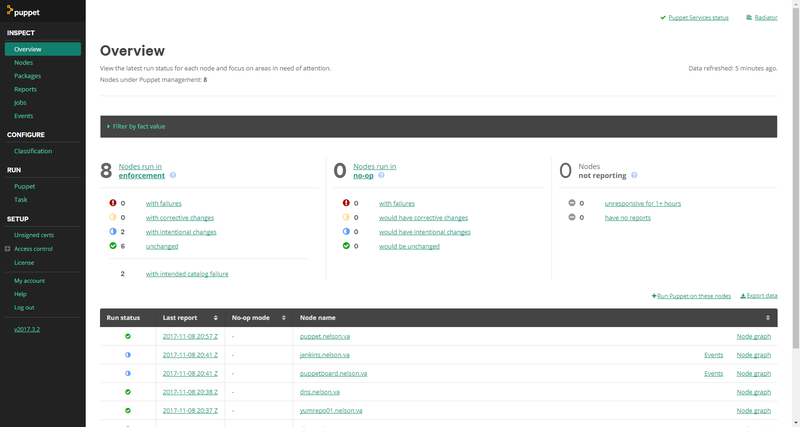 You should now be able to log into the Console and see the status of your environment. You will hopefully find Intentional Changes on most of your nodes and zero or no failures (if both are encountered in a run, Intentional Changes “wins” on the Console; let every node run at least twice to see if it moves back to Green or Red before continuing). If you do encounter failures, you will have to analyze each issue to see if it’s related to the upgrade and something you can fix, or if it’s time to roll back. If you do roll back, make sure you roll back ALL the PE components, including the PuppetDB, so you don’t leave cruft somewhere. I experienced one issue in the lab described in PUP-7878, resolved by a reboot of the master after the upgrade. If everything is good, then it is time to proceed to upgrading the Agents. I assume the PE component updates are based on facts only present with Puppet 5, facts that would not be present during the first run while the agent is still Puppet 4. Subsequent runs are stable. I do not have a Windows agent to test with in my lab, I assume it looks similar but cannot verify. Be sure to test at least one Windows agent before releasing this change across your entire Windows fleet. I mentioned Hiera 5 already, which I’ll discuss further in another post. I also want to immediately enable the Package Inventory. As described, I can update the Classification of the PE Agent node group to include puppet_enterprise::profile::agent with package_inventory_enabled set to true and committing the change. While it takes affect immediately, your agents need two runs to show up: the first changes the setting so package data is collected and the second actually collects the list. Once that happens with at least one node, you’ll start seeing data populate on the Inspect > Packages page. I do not have need for High Availability myself, but that seems really cool. In the past, it’s been quite the pain in the behind to automate yourself. I have not used Orchestrator in anger before, and I do Hiera overrides in my control repo, almost ignoring the Console Classifier otherwise, so I probably will not be exploring them very well. However, I’m really excited about Tasks, that’s something I hope to explore during the winter break, perhaps by upgrading bash across all my systems! Today we looked at why we want to upgrade to the latest Puppet and upgraded a Puppet Enterprise monolithic master and some linux agents. It’s not that hard! We also staked out features that we want to investigate and turned on the Package Inventory. There are a lot more changes than I listed, along with tons of fixed bugs and smaller improvements, so I recommend reviewing the release notes for each version to see what interests you. I hope to be able to look into Hiera 5 and Tasks soon, look for new blog posts on those! Let me know if there’s anything else you’d like to see discussed in the comments or on twitter. Thanks! Edit: In an earlier edition, I credited the wrong newsletter as the source. My apologies to R.I.Pienaar! In this past week’s DevCo Newsletter, I saw the Rebex SSH Check, which reminded me that I’ve locked down the SSH server security configuration at work, but not at home. Sounds like a good opportunity to blog about the process! Now, I’m in security, but I’m not all that about the security settings. The names vary from descriptive to really obtuse, and there’s three keys that need managed: ciphers, MACs, and KexAlgorithms (that’s Key Exchange Algorithms, which is the name I’m more familiar with). The key to security is knowing when you don’t know, and seeking out that expertise. I am very thankful for Mozilla’s really great security guidelines, including an OpenSSH guide. There are sections for Modern and Intermediate security, depending on what is available for the systems you are securing. For me, these align with the Red Hat/CentOS EL7 (Modern) and EL6/5 (Intermediate) distros that I use. The first step is making sure we have a tier in hiera for each OS/release we support, otherwise sshd could fail to restart when it encounters a cipher set name that is unknown to the openssh version in use. That could be bad, especially if we don’t have some form of iLO console to the nodes, though if we have puppet running on a regular basis or through mcollective, we *should* be able to recover. In any case, you definitely want to check run status of your nodes after this change to make sure you don’t discover a problem when you’re trying to troubleshoot some other problem. This change will need to be put in place on the master, the master service restarted, and no dissimilar configs exist in the wrong location before agents will see the changes we make below (I had a /etc/puppetlabs/code/hiera.yaml that slightly vared from /etc/puppetlabs/puppet.hiera.yaml and it kept winning out till I removed it and restarted pe-puppetserver). You can force the run now, or wait up to two full run cycles before verifying that all your agents see the changes. If you don’t add this, then you’ll only get the first ssh::server::options values found, even for sub-keys like Ciphers that were not set at the higher tier. Once all of these changes are in place, your agents should get the new settings and restart sshd. Any new ssh connections to the affected servers will use the specified security sets and ONLY the specified security sets. Existing connections will persist until the server or client end the sessions. We can now use curve25519-sh256@libssh.org as a KexAlgorithm with an EL6 node, but we would fail to connect to an EL7 node as only diffie-hellman-group-exchange-sha256 is available. If we re-run the Rebex SSH Test, our Modern servers show all green now. Success! Addendum: Peter Souter notified me on twitter about his mozilla_ssh_hardening module (GitHub only at this time) that enforces the Mozilla recommendations on Ubuntu 16.04, CentOS 7, and CentOS 6. You can use that module to replace some of the work above, as long as you do not require conflicting customizations. I still hope this articles helps you understand the workings of hiera merges and the need for vetted security configurations. If you missed the news this past week, the Puppet 5 Platform was released! Read the announcement and the release notes for some great details. Congratulations to everyone at Puppet for getting this new release out the door. I’m looking forward to diving in with it as soon as a Puppet Enterprise release is out, since I’ve converted even my home lab away from Puppet Opensource. There are a few things I’ve learned from the announcement thread, slack, and my own experiences with it in the last few days. It’s still early, so I am sure this will get out of date quickly, but I hope it helps others in the short term. Puppet 5 AIO provides Ruby 2.4.1, so your tests should use it as well – even if you’re not using AIO puppet, it’s still helpful for any puppet modules. PuppetDB requires postgresql96, but it’s not a dependency on the puppetdb package, since you can install puppetdb and postgresql on different hosts. Version 4.x works with postgresql96, so upgrade that first, then puppet. Detail here. Puppet 5 includes a vendored version of the semantic_puppet gem. In Puppet 4.7 and below, it had a dependency on the external semantic_puppet getm. The gem is used by metadata-json-lint, which is often part of a puppet rspec test setup. Check out the metadata-json-lint README installation section to see how to deal with this. If your tests run against ~> 4.0 then you’re probably okay. There’s a new version of puppetlabs_spec_helper that apparnetly has some issues with spec fixtures and symlinks (from slack, nothing to quote). I haven’t hit this myself, it might already be fixed, but something to be aware of if you have symlink-related issues during testing. The combination of Puppet 5, rpsec-puppet, and the new puppetlabs_spec_helper are more stringent than Puppet 4 is. I’m not sure which of the three components specifically triggers it. I was testing for a resource that required another service, which was not part of the define I was testing (here). With puppet 4, this was fine, but with puppet 5, it started generating errors in this travis run. The fix is simple, through using a pre_condition to provide the service in the catalog, seen in this commit. The first Puppet Enterprise release including Puppet 5 should be out sometime this fall. I haven’t written a blog post in a while because I’ve been bogged down in work and life and not had much time in the lab. To make sure I don’t get too out of practice, I’m going to try writing some shorter tips and tricks articles. Let me know what you think. A few days ago, someone asked a great question on the puppet-users mailing list about the location of config files in the roles/profile pattern. It’s a good question, and we can go deeper because it assumes the location of config files outside of that pattern, too. I’m going to explain where I keep my config files, and templates, in the various types of modules. There’s no single correct answer here, this is just a framework for me. To start, let’s describe the types of modules. Component modules describe a single application/technology/thing and are designed to be consumed by end users. This is pretty much anything on the forge, such as puppet/hiera to manage a Hiera implementation or puppetlabs/apache to manage apache, vhosts, etc. There’s also a sub-type of these modules, Private Components. The line here is blurry, but think component modules that are not designed to go on the forge. This could be a module for a company’s internal application, very similar to a traditional component module, or an cluster of custom facts. Pretty much anything that’s not a Component module, or our final type: Profile modules. This last type is the collection of classes that make up your role/profile pattern implementation. They’re often simply called profile, but maybe there is more than one module if you have a lot of business groups using the puppet system. They differ from both types of component modules in that they contain the business logic of your implementation and are where you compose the collection of component modules that you use. I wrote an article on what goes in a role or profile, too. In Component modules, the relevant configuration files or templates for the component are collected. In an ssh module, you’d have the ssh_config and sshd_config data; a sudo module would have sudoers and a template for sudoers.d/ files. Private Component modules vary quite a bit in functionality, but I treat them like regular component modules. If the module is for custom facts, there’s no need to put files or templates in it. If it’s for an internal app, the configuration files are stored in that module. Your Role/Profile modules are a little more complicated. If you have a component module for apache, you likely have a profile class for apache, perhaps profile::apache or profile::somegroup::apache. The component module probably has its own file or template, but it may accept alternative files and templates. In this case, I create a sub-directory with the module subclass name, such as files/apache or templates/apache, and add the file(s) there, e.g. templates/apache/vhosts.erb. This is a pretty simple layout. The only real difficulty is when you have a private component modules and a profile for that component: do you put the file/template with the profile or the component module? I tend to lean toward the private component modules first, but I’ve done both. I hope this helps and I’d love to hear of any other layouts you’ve had success with! Over the past three years, my Puppet for vSphere Admins series has meandered through a number of topics, mostly involved on the Puppet side and somewhat light on the vSphere side. That changed a bit with my article Make the Puppet vRealize Automation plugin work with vRealize Orchestrator, describing how to use the plugin’s built-in workflows to perform some actions on your VMs. However, you had to invoke the workflows one by one, and they only worked on existing VMs. That is not good enough for automation! 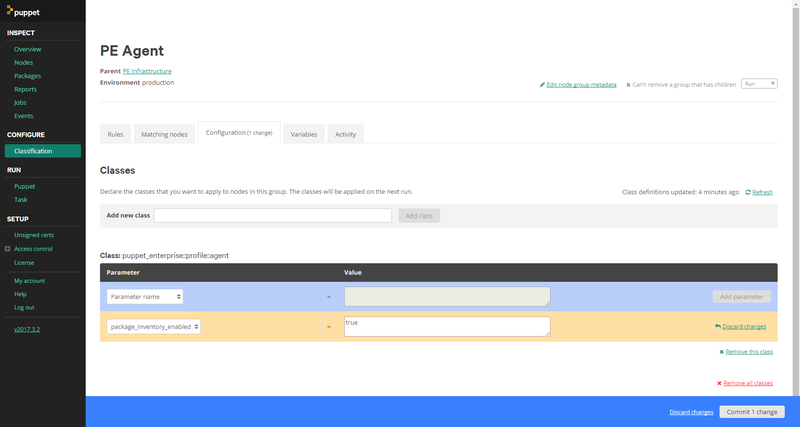 Today, we will start to look at how to integrate the Puppet Enterprise plugin into other workflows to provide end-to-end lifecycle management for your VMs. Last week, I moved the home lab to Puppet Enterprise. One of the things I love about PE is the Console. However, I am a member of Vox Pupuli and we develop Puppetboard (the app AND the module) so it is convenient for me to use it and tie it into PE as well. Though the two overlap, each has functionality the other doesn’t. I really love the count of agent runs by status on the Puppetboard Overview page, for instance. After my migration, however, my previously-working puppetboard just gave me HTTP 500 errors. Fixing it took some wrangling. Thanks to Tim Meusel for his assistance with the cert issue. What goes in a Puppet Role or Profile? # Include OS specific base profiles. The Roles and Profiles pattern is all about composition. The Style Guide helps you with layout and semantic choices. It doesn’t hurt to add your own rules about content and design, too. There’s no defined Best Practice here, but I hope these guidelines help you shape your own practice. Enjoy!